You may have seen my previous post on six footwear and accessories finds from MAGIC Market Week. 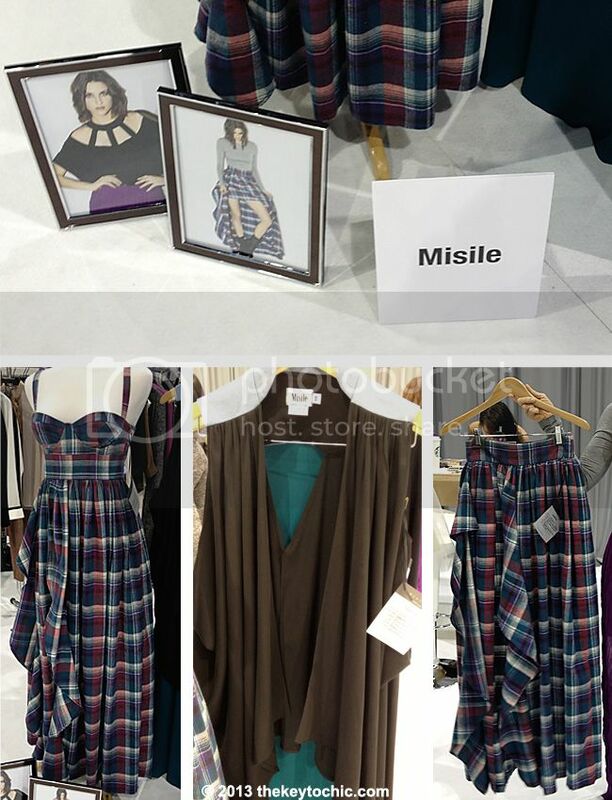 Here I'll focus on six clothing brands whose booths I browsed during my time on the trade show floor. As much as I adore shoes and jewelry, I also enjoy looking at the clothing trends and getting a peek at what will soon be in stores. 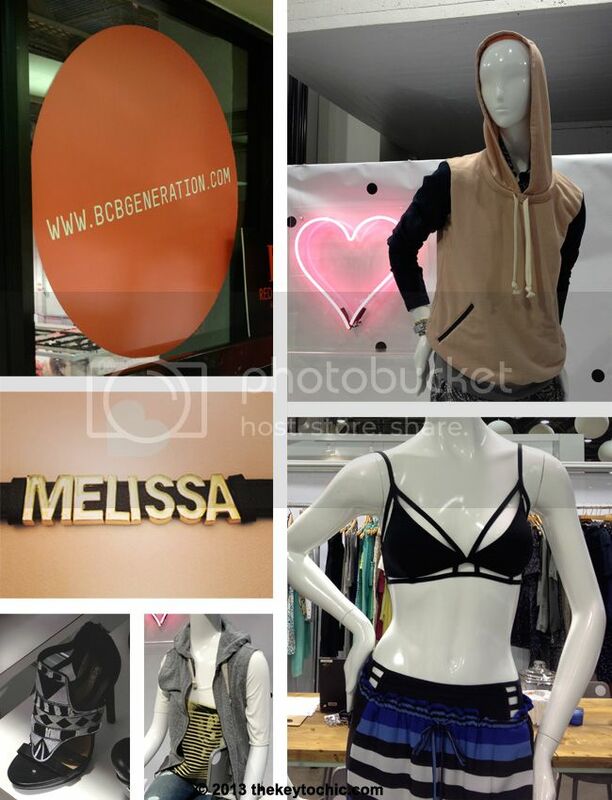 First up is BCBGeneration, where I was able to visit the skybox for a unique bird's eye view of the trade show floor. The hospitable ladies in the skybox lounge kindly made me a personalized name bracelet. (I considered doing The Key To Chic on the bracelet, but thought it would be too long.) As I wandered around the booth, I noted that sporty looks with color blocking, graphic stripes, and relaxed silhouettes predominated, as did mixed material footwear. 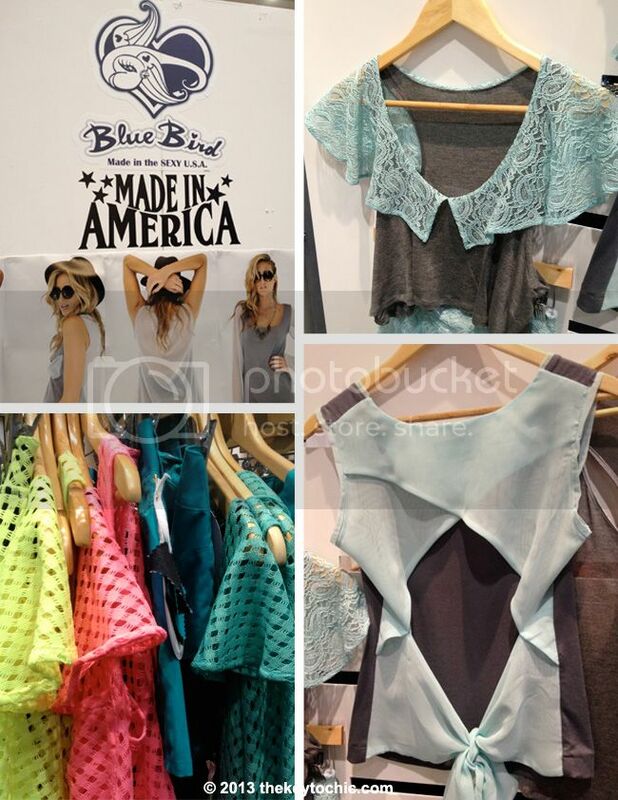 At POOLTRADESHOW, I stopped by the BlueBird booth, where I met friendly and free-spirited designer Anna Friss. She showed me her youthful spring 2013 pieces in a soft palette of mint and gray, in addition to bright mesh tops, skin-baring blouses, and fun shorts with appliqué details. It's safe to write that the refreshing color combination of mint and gray is now one of my spring favorites. If you follow me on Vine (@thekeytochic), you may have seen a closer look inside the booth. 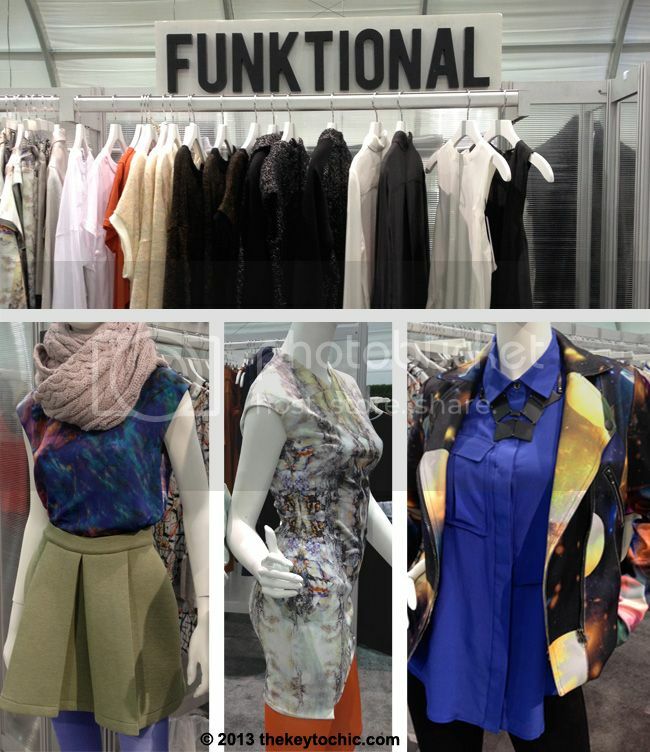 At ENK, the modern digital prints by Funktional caught my attention. Since colorful prints and bold graphics are on my style radar for spring, I was especially drawn to the galaxy print moto jacket on the lower right. 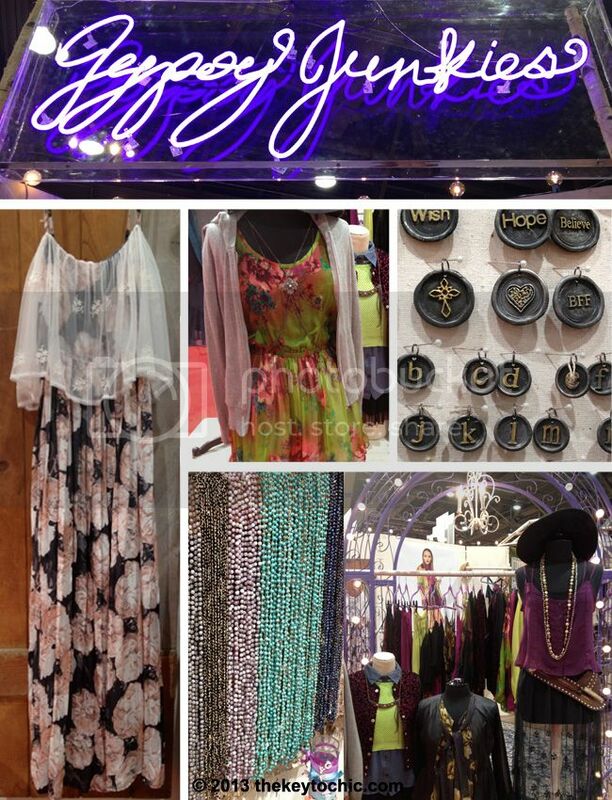 A trip to MAGIC would not be complete without a visit to the Gypsy Junkies booth, which is always a feast for the eyes. 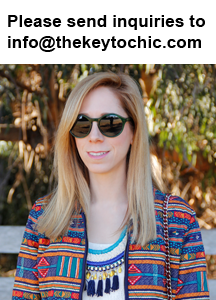 When I wasn't distracted by the selection of florals, printed baseball jackets, acid brights, velvet, and sheer fabrics, I gazed at the wide selection of bohemian chic jewelry. How charming are these beaded necklaces and personalized pendants? Yup, I want it all. As I walked through the Emerging Designer Showcase, the plaid bustier dress by Brooklyn-based line Misile NYC stopped me dead in my tracks. Its mix of feminine shape with a masculine fabric intrigued me. As I browsed the collection, the ultra soft flannel, jersey, and lace pieces with their silk linings made me take note. I spoke to designer Rhonda Puccini, who told me that she was inspired by the grunge looks of the '90s. Having just attended a trend seminar where "Glam Grunge" was featured as a 2014 trend, these pieces really resonated with me. What further impressed me about Misile NYC was the quality of the craftsmanship and the use of luxurious, tactile fabrics. I can easily imagine any of these pieces in the pages of Elle or Lucky. 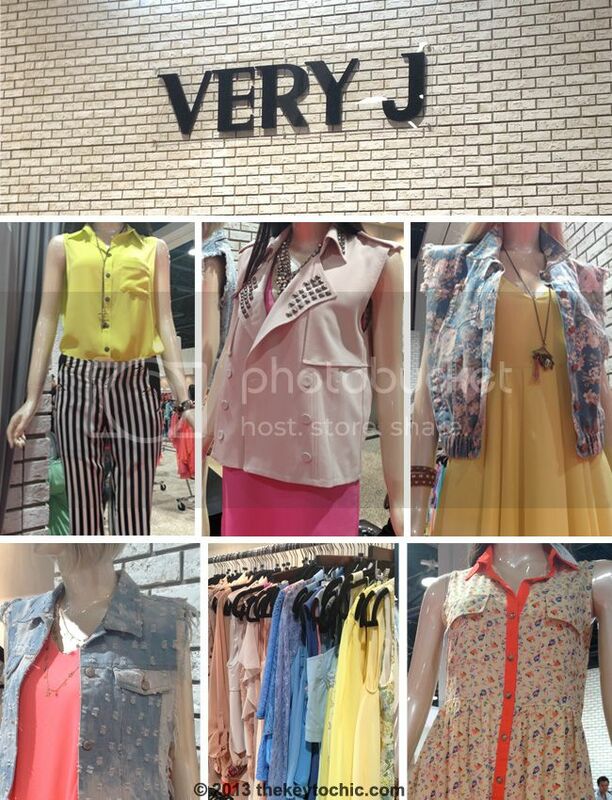 At the booth of Los Angeles-based brand Very J, I discovered a fun mix of embellished vests, chiffon tops, and floral prints for Juniors in a palette of soft pastels with some bright yellow items catching my attention. On the topic of prints, since black and white is a key trend this spring, I thought the striped pants (below on the left) were a flattering take on the trend. I hope you find something that inspires you. What stands out to you? Let me know in the comments.